Elliptical trainers or Cross trainer are one of the latest types of equipment to become popular for both the home fitness enthusiast and regular gym visitor. Elliptical trainers are becoming increasingly popular as a means of cardio training and can help to lose weight and tone the body. 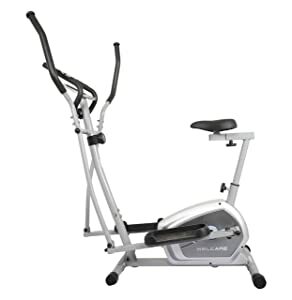 Elliptical trainer is basically a combination of a ski machine, stair stepper, and a elliptical stationary bicycle, but has the functions of rowing and cycling too. Part of the popularity of elliptical fitness equipment is due to the fact that it can provide a full body workout without placing too much strain on the joints. The technology is based on the elliptical motion that the body utilizes when it’s walking or running. The goal of the elliptical trainer is to give you the ultimate cardiovascular workout. The natural movement of an elliptical cross trainer allows you to maintain a longer workout and it doesn?t put unwanted stress on muscle joints. The weight bearing technology of a cross trainer reduces the risk of spinal and structural pain by supporting the natural curves of your body during the workout. Training with an elliptical trainer may provide you with a multitude of benefits. Here is the list of the 8 best elliptical trainers that are currently trending out there. Welcare is a fitness equipment brand that needs no introduction. It is one of the best fitness equipment brand in India. They are known to manufacture the best quality fitness equipment in the market. just like every other product even Cross Trainer WC6044 is one of their best creations. This fitness equipment has been designed keeping in mind the needs of the customers. The brand aims to promoting an active and healthy lifestyle with the help of their products. The cross trainer WC6044 comes with all the necessary features that you need. For the ones who are willing to buy a cross trainer for their house can definitely go for this model form Welcare. However, before buying it you should once take a good look at its features. The machine is equipped with 4 kg flywheel with two-way rotation. This is known to help in increasing the momentum of your speed while reducing the impact on your knees. There is a large LCD screen on the cross trainer that is used to track speed, distance, time, heart rate, scan, and calories burnt. This keeps the users up-to- date on the progress made. With the help of the 8 levels manual magnetic resistance control, you can easily adjust the intensity of your workout. You can also make an adjustment to the seat based on the height of the user. The machine also comes with 14 inches stride length which is big enough to give you a smooth workout feel. You need to pay extra charges for the installation of the machine. This cross trainer is particularly designed to promote smooth and effective workout in the house. With long stride and optimal handlebars this machine makes ideal fitness equipment for all the fitness freaks out there. To make things even more convenient for the users, the machine is also equipped with wheels which promote easy transport. Other than that it also includes quite a few useful features which are listed below. The equipment comes with 8 resistance level that provides a perfect variation to your workout. The machine can support up to 110 kg in weight. The machines are also equipped with knee stress reduction ergonomics. It also comes with flywheels to console technology that makes the equipment durable for years. The machines have also got 7 kg flywheel. It also has wheels which make the machine easy to move around. This is yet another cross trainer model that we have from Welcare. The machine has been designed keeping in mind the needs of the customers. If you are looking forward to buying an effective cross trainer machine to use in the house, you can definitely consider this model as one of your options. It comes with a large LCD display that shows speed, distance, time, pulse, scan, and calories burned. The machine is also equipped with a pulse pad which helps in maximizing your workout with the ultimate tool. The stride length of the machine is 18 inches which provide you with a smooth workout feel. The machine also comes with 6 programs. The seats are made oversized and are also easy to adjust according to your fit. It also has 8 levels manual magnetic resistance control that allows you to adjust the intensity of your workout. This is one powerful cardiovascular cross trainer available out there. This machine is ideal for an effective workout session. Check out its features listed below. The machine has an LCD screen which shows you time, speed, distance, and calories. The machine also comes with magnetic resistance and magnetic mechanism which provides you with a smooth and quiet workout. It has got textured and fixed-incline pedals which provide you with maximum stability and grip. It can support up to 110 kg of user weight. It also includes an inner magnetic system which allows you to drive the bike smoothly. It is EN-957-1 &amp; 9 certified. The durability of the machine is questionable. This is a well designed sleek cross trainer is all you need for an effective workout session. The machine is known to provide you with a smooth workout. Not just that, but it is also equipped with the right features. It has a stride length of 14 inches. The machines also come with 10 kg of flywheel weight. The machine has got a large LCD display which provides you with important information on speed, distance, time, calories etc. The machine is quite expensive. If you are looking for a cross trainer that can provide you with a balanced motion and effective workout session, you can surely consider this model on your list of options. This cross trainer has got more than you expect. This is an ideal cross trainer machine for all the fitness junkies out there. For full body workout, the machine has got 14 kg flywheel. It comes with an LCD display that shows time, distance, speed, calorie, pulse, and other information. The machine provides you with 16 levels of computer-controlled magnetic resistance. This allows you to adjust the intensity of your workout. The machine has got oversized footplates for comfortable training. It comes with 15 programmes. This is yet another cross trainer machine that is doing quite well in the market. The machine has got an elegant look and also provides you with an effective workout session. It comes with a stride length of 20 inches. It has got 7.66 kg of flywheel weight. The machine is also equipped with 1-20 levels of resistance control. The machine comes with a large LCD display that provides you with all the important information like time, distance, speed, calorie etc. Lastly, on our list, we have the Xterra FS1.5 Steel Cross Trainer. The machine is mainly designed for home use. With its elegant design, the machine also provides you with a smooth and effective workout. Not just that, but it has also got all the right features as well. It comes with 14 inches of stride length. The machine has a Dc supply power source. The LCD screen provides you with all the important information including time, distance, speed, calorie etc. So these are 8 of the best cross trainers that you can choose from. All the mentioned cross trainers are designed to provide you with a comfortable and effective workout at home. The list contains cross trainers of all ranges so, it should be easier for you to make your choice. What to look for While Buying Elliptical trainers ? Firstly, choosing an elliptical trainer should be easy when you look at the features of the machines that you need within your facility. 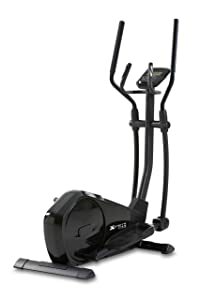 A weight bearing elliptical trainer will supply the user with exactly that; this will help the user to train towards a healthy bone structure. Other features to choose from, and in our opinion the most important, are the programmes that the machine offers. The wider the range of levels, the better for your business and for your users as a wide range of clientele can then make use of the machines. Think about the intensity of workout that the machines can provide, and the speed at which the user can choose to workout at. Check whether the machine easy to stop in an urgent situation or does it have a safety ‘stop’ clip that the user can attach to their clothing while using the elliptical. Price and guarantees are an indicator but the best test of all is feel. 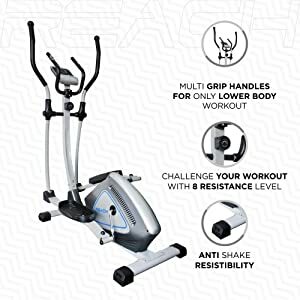 While there are some great deals available on elliptical trainer online and it is tempting to whip out your credit card and order one so you can get started on a home workout straight away, with ellipticals, more so than treadmills or steppers or bikes it is important to find someplace where you can actually give the machine a workout. How to Utilize Elliptical Cross Trainers for Weight Loss ? 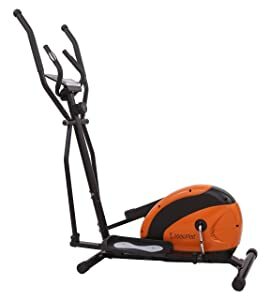 If you did hear a lot of people comment that elliptical trainer does not helps them in weight loss and their exercise machine finally turn to be a gadget for them to hang clothes, please find out the reason behind before jump into negative conclusion towards this fitness equipment. Basically, there are two major reasons caused people failed their fitness goal include lack of self-discipline and calories consumed are more than burn via exercise. No matter what objective you plan, self-discipline is necessary attitude to drive yourself success. Yesterday spent 30 minutes to do workout, today skip with excuse of busy (perhaps no time?) and expect tomorrow double up the workout time. Is this kind of scenario sounds familiar and people a lot you almost having such experience? Only people have higher level of self-discipline could commit themselve and consistently do workout using elliptical trainer. According to a research, a person manages to burn 500 calories per hour using an elliptical trainer. Based on this theoretical concept, if a person consistently workout and burn 500 calories a day for a week, he definitely could see a great result after few weeks. However, he probably disappointed if he consumed more than 500 calories per day. By now, you could conclude that elliptical trainer benefits for weight loss if consistently use it in proper way combined with a healthy diet. Understood people nowadays always busy with their jobs either have tight working schedule or a lot of household chores waiting them to settle. It is very difficult to spend an hour everyday for exercise. If there is the case, then allocate at least 10 minutes to do exercise. Exercise by using elliptical trainer is not only for weight loss purpose but also for your health as well. Better still, if you manage to spend about 30 minutes everyday as this allows your heart rate to be elevated for a consistent period of time consequently burn calories. 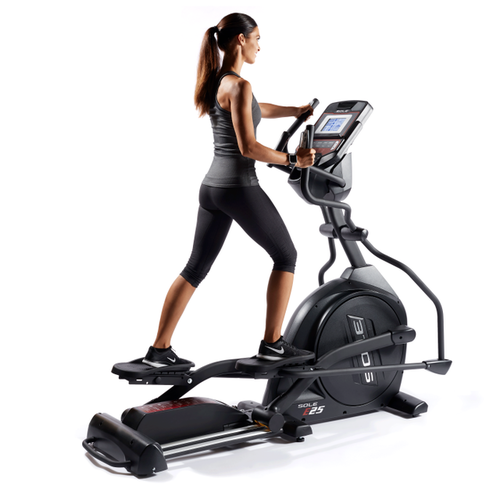 There are elliptical cross trainers such as models present at feature corner come with pre-programs that have few resistance levels. You could begin your workout with a low incline for about 2 minutes then turn to higher incline for another 2 minutes. You will see a great result by incorporate interval training into your workout. Additionally, add more resistance into your workout to a level that pushes you without becoming too fatigued that definitely help in weight loss and tone muscles. Because your feet travel in an elliptical pattern and never leave the footrests there is no impact stress, unlike running on treadmills where your feet are continually slamming into the track, or even stair steppers where the sudden direction change is classified as impact. Your ankles, knees, hips and back will thank you for this, now and in the future. Unlike bikes and rowers, cross trainer’s give full weight bearing workouts. Good for increasing bone density and muscle strength. Lack of impact gives the impression you haven’t worked out as hard as you have. Tests show, however, you will have burned the same amount of calories as if you had been on a treadmill, but without the sore joints. Using a full body elliptical cross trainer your heart rate will rise quicker to the optimum aerobic workout rate for burning calories of 160 – 170 beats per minute. A full cardio session in 30 to 40 minutes.